A quick trip to Port Alberni this weekend to get winter tires for the car. Why Port Alberni for those who know the area? Nanaimo (our closest shopping center) didn't have them in stock. So up "over the hump" we went. Rain and wind have left their mark on the forest. Great swaths of golden leaves littered the sides of the highway. There was still plenty of yellow glowing brightly against the dark evergreens on the hills. Tires purchased, we stopped for hot chocolate and four mini doughnuts at the Donut Shop. You can see their claim to fame in the mosaic above. The store runs on a cash only basis and we had to scramble to come up with the $4.20 for two chocolates and the donuts. Home again, with a very short stop at Cathedral Grove, home to a preserved stand of very old trees. The photo where Tim looks so small is taken in front of the oldest tree in the park - 800 years old. It's 76 metres tall, higher by quite a bit than the Leaning Tower of Pisa which is 56 metres tall. I craned my neck back as far as it could go and still couldn't see the top from so close to it. I'm glad these natural areas are being preserved. We need to wonder at creation's majesty. Thank you to Mary at the Dear Little Red House for hosting another Mosaic Monday. Please visit for more glimpses of life from around the world. That tree is tall! And that leaf is huge! Glad that you found enough money for the hot chocolate and donuts...it looks cool and damp there. 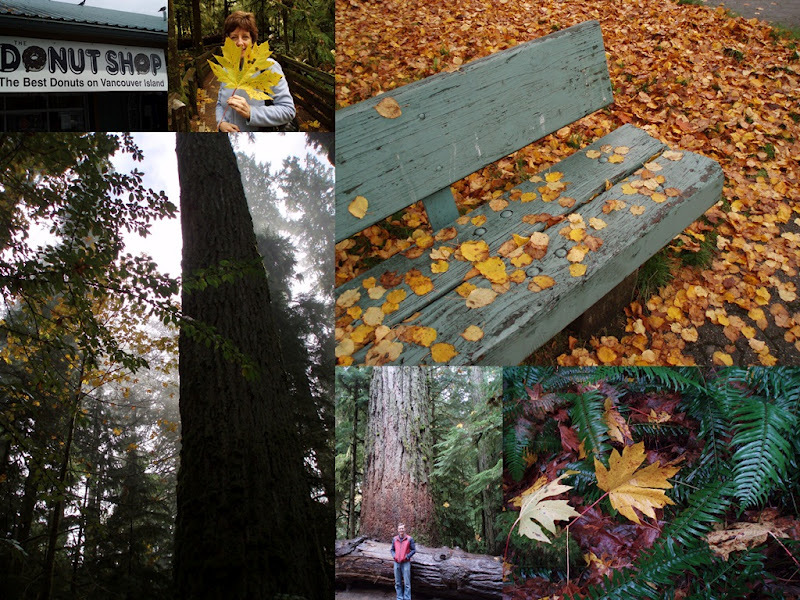 Lorrie - Cathedral Grove is one of my favorite places - it's so aptly named. Your mosaic takes me right there. Your header is wonderful! Wonderful images. Love the sign for the donut shop with the *outside* world! The trees are so majestic. Mother Nature sure knows what she's doing! Love that big tree too! That sort of thing always fascinates me. Lovely peacefull autumn photos in your mosaic, Lorrie! I bet the donuts were so good and worth the scramble for cash. That large leaf is stunning! Beautiful images. Hope your Monday is blessed with good things! Creations majesty...you are so right. We visited Cathedral Grove a few years ago and were so impressed with the huge trees. I love Vancouver Island! Love that bench surrounded by those golden leaves! Wow! That is one giant leaf! and the donuts sound good this morning. That is so pretty...and majestic. Great job for stopping...sometimes we just need to slow down to notice the grandeur that surrounds us. What a colorful mosaic. I miss the colors of fall. You new blog look is just beautiful. A lovely mosaic and the Japanese pastries look interesting.